Today is Christmas, so let's review someone who's famous for eventually dying and returning from the grave. Both a wealthy heiress and a trained assassin, Elektra Natchios is a mysterious woman from Matt Murdock's past who unexpectedly returns to his life. Elektra was teased, briefly, in the first season of Daredevil, but she was introduced for real in Season 2. The show presented her origin from childhood on up, making her a character in her own right, not just "Matt's girlfriend." For a change. In fact, he was a character in her storyarc, not the other way around: the things that happened to Elektra happened because people were after her, not because she was a way to get at Daredevil. For a change. It just goes to show you that you don't have to pass the Bechdel test in order to have a decent female character - it just requires that you write them with agency. And all that takes is treating them like a human. One of the things the series explains handily is how the French-Cambodian Elodie Yung can play the Greek Elektra Natchios. Yes, Daredevil's Elektra is also GI Joe's Jinx. The likeness on the unmasked face isn't terrific, at many angles looking more like Jennifer Garner - yes, the other Elektra. The one we're not supposed to talk about. 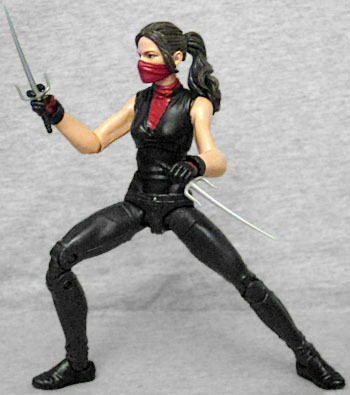 Ellie is wearing her simple ninja-fighting outfit, so most of her sculpt is shared with Jessica Jones - Hasbro's wasting no time in putting these "woman in jeans" molds to multiple uses! She has the same bare arms as MJ, but her chest is unique: ber black shirt has a plunging neckline, and underneath that she's wearing the red sweater thing that is the show's tie back to her traditional comicbook costume. Unfortunately, there's a small problem with that. Her alternate head features her with her "ninja mask" on - in reality, just the collar of her sweater, pulled up over her nose. Which is fine, except that the toy has a bare neck, so it can accommodate the unmasked head; that means when she has the masked head on, there's a gap between the two parts of her shirt. Poor planning! Also, the prototype image on the back shows her with a touch of red paint on her shoulders, but that didn't make it to the final toy. Naturally, Elektra's weapons are a pair of sais, because what has TMNT taught us? That whoever wears red wields the sai. If Frank Miller had had Elektra colored orange, then Bullseye would have been clubbing her to death with nunchucks. 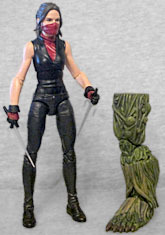 These accessories are new pieces, not reused bits from any previous Elektrae, and she has new hands to hold them: the bands on her wrists make the hands look like gloves, and the right hand is molded for a "split finger" grip on the weapon. Now that's nice! 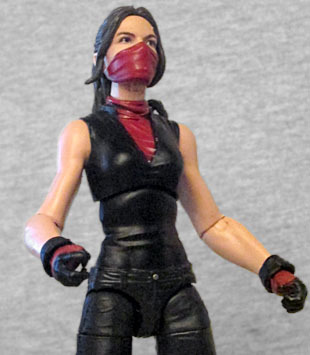 And she has all the usual articulation, so she'll be able to kick some Hand Ninja behind! The figure also comes with a piece of the Man-Thing Build-A-Figure, because that's what this series is all about. She's got the left leg, which is barely any larger than her own leg! Bet the final figure is a ton bigger, though. Daredevil did an excellent job bringing Elektra to life. She had a backstory, she had a motivation, she had great fighting skills... and now she's got an action figure that's kept from greatness by a few niggling mistakes. But at least she has that figure, which is more than we can say for any previous live-action Elektras.